Britain’s Katie Archibald and Elinor Barker claimed further gold medals on day two of the UCI Track World Cup in Milton, Canada. 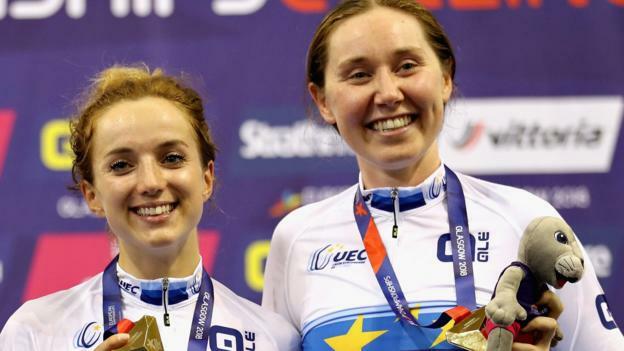 After team pursuit gold alongside Laura Kenny and Ellie Dickinson, Archibald and Barker joined up for the Madison, set for an Olympic debut at Tokyo 2020. The British pair recorded 36 points, 17 clear of second-placed Denmark. Olympic champion Jason Kenny sealed his first gold of the World Cup season with success in the keirin. Archibald and Barker won 10 points in the final sprint but the race was secure long before then, with only silver medallists Amalie Dideriksen and Julie Leth scoring more than half the British team’s total. More than a decade after his first World Cup gold, 30-year-old Kenny added to his collection after a thrilling final race. After finishing third in his heat, he crossed the line in 10.335 seconds, 0.042 seconds ahead of Canada’s Hugo Barrette, with Matthijs Buchli third. Mark Stewart, second in the individual points race medal in France last week, captured another silver, this time in the omnium. In France last week, Britain won six medals at the opening round of the six-stage Track World Cup series, which includes qualification points for the Tokyo Games.